SFD director Supian Ahmad (third right) presents a copy of `Ensera Mayas Enggau Bansa Iban’ to Sudarsono. WCS Malaysia director Dr Melvin Gumal is at fourth right. 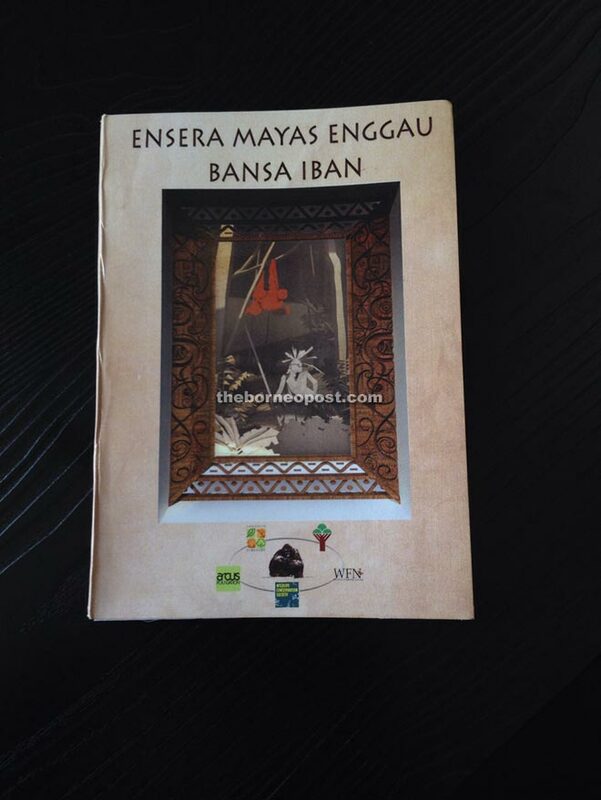 The book `Ensera Mayas Enggau Bansa Iban’ contains 37 legends that depict the relationships between the orang utans and the Ibans in Ulu Menyang. SRI AMAN: The state government has rejected applications for logging licence and oil palm plantation in Ulu Sungai Menyang Forest (Menyang) in favour of a new conservation model. 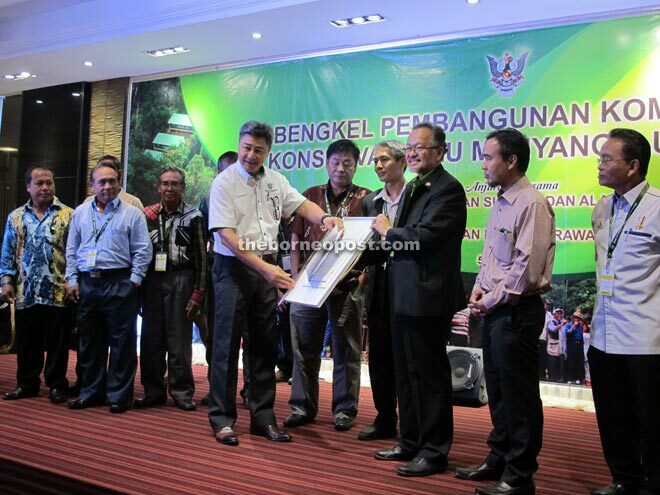 Permanent secretary of the Ministry of Resources Planning and Environment, Datu Sudarsono Osman, said usually when the government deemed a forest was of high conservation value, it would gazette and declare the area as a national park or wildlife sanctuary, and extinguished all the locals’ rights over the land. For Menyang, however, a different conservation concept is used. Under this concept, the government allowed the affected community to continue to own the land, but the government would closely monitor development activities to ensure conservation efforts were not compromised. “This model will be one of the first where we want to preserve the natural habitat of the orang utans and also acknowledge that there are already people there. They need to co-exist. “So, it is about balancing the need for conservation and the need of the local community,” he told The Borneo Post after officiating at the Ulu Sg Menyang Community Development and Conservation Workshop and launch of the book `Ensera Mayas Enggau Bansa Iban’ here yesterday. Sudarsono said it had been found that the orang utans tended to live near human settlements, where they could easily find food, and in Menyang, the Iban community had co-existed with the orang utans for centuries. As there had been eco-tourism activities in the area, Sudarsono said the government hoped to enhance these activities to ensure that the pilot model succeed. He added that as the attempt was the first of its kind, his ministry would fast track it to ensure not only its success but that those affected would get a consistent high income. Earlier, in his speech, Sudarsono said preservation and conservation of wildlife in Sarawak had been carried out since the 1950s, and six areas had been identified as orang utan sanctuaries or national parks. These areas are Batang Ai National Park, Lanjak Entimau Wildlife Sanctuary, Sedilu National Park, Ulu Sebuyau National Park, Maludam National Park, and Gunung Lesong National Park. The government had also set up infrastructure, such as Orang Utan Conservation Excellent Centre at Ng Delok, Batang Ai, Semenggok Orang Utan Rehabilitation Centre, and Matang Wildlife Centre for the research and rehabilitation of orang utans. Ulu Menyang, spanning 14,000 hectares, is situated beside Batang Ai National Park. Between late 2012 and early 2013, a survey done by SFD, SFC, BA and WCS found 995 orang utan nests and about 200, orang utans of the ‘pongo pymaeus’ sub-species were detected in the survey area.